What’s your lasting memory of nativity plays at school and or church? For this week’s blog we have the reflections of Josh and Lindsay Bruce, members at St Cath’s, who are over from America and in Edinburgh for studies. The movie A Charlie Brown Christmas is an American holiday tradition: it doesn’t feel like Christmas in the states until you’ve seen this movie at least once. This year, our family decided to make new traditions by staying in Edinburgh rather than going home to the states for Christmas. Not just because we’d heard how good the weather is during December (bad joke), but because we wanted to experience a true Edinburgh Christmas. 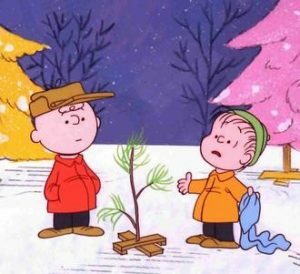 So far, we have obtained a Christmas tree that is not unlike the plucky little tree in this picture from A Charlie Brown Christmas. Due to the ‘dreich’ weather and the need to run the heat, our Christmas tree has dried out and shriveled up to a third of it’s original size, leaving pine needles and bits of branches all over the floor for our two young boys to eat (er, that is, to pick up and throw away nicely in the rubbish bin). Despite the weather and our shrinking Charlie Brown tree, our Christmas in Edinburgh so far has been truly wonderful, especially because it has given us a chance to learn about Scottish nativity traditions. The following Sunday, both our boys were involved in our church’s nativity at St. Catherine’s Argyle Church. The whole congregation was involved with audience members making the sounds of animals from the stable and cheering on the cast members. But they were short a Joseph. Having once practiced the part of a wise man, our older son refused to play any part but that of a wise man. (Perhaps he has a future career as a method actor?) That left our not-yet-two year old to fill in as Joseph, with his size 7-8 year costume rolled up and pinned by the Sunday club teacher’s hair tie. He nonchalantly sat up in front of the entire church during the performance, dancing along to the songs and exchanging race cars with the donkey, who had smuggled in the toys for entertainment during the long journey to Bethlehem. Walking home from church we asked our older son how he felt about performing in these nativities. After his serious performances, we thought he might say he was nervous or timid on stage. Instead, he said being in the nativities made him very happy. And that’s how we felt watching it: very happy. These beautiful nativities, with all their hilarious mishaps, bring us all joy as they capture the true meaning of Christmas.